Lucas relies on his special attacks a lot, but that doesn't mean he can't hold his own in a close range fight. His side smash is fast and weak. 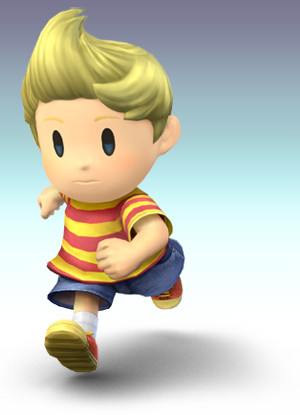 Lucas's best asset is his upward smash, even if it is a little slow; dealing over 30% damage when charged and combining it with a high, straight up knockback. PK freeze is a nice move for damage dealing, because frozen foes take more damage than others, but don't forget that PK freeze gets a movement boost in the direction Lucas is facing, so aim appropriately. PK fire isn't very useful, but it's good for repelling charging enemies and hitting groups of enemies. Also, note that Lucas' PK fire does more impact damage than Ness'. PSI magnet is also very useful, being that it is one of the few moves in the game that can restore HP without items. Use it against any energy based attack, and you get a large amount of HP back. Watch out though, it doesn't work against non-energy projectiles, such as link's arrows or Samus's missiles, and it never works against melee attacks. You can also use PSI magnet to repel your enemies if they are close by; if you release the button, turning off the magnet, any enemies that are within range will be thrown horizontally and take a small amount of damage. Lucas's best trick is his PK thunder. It is easy to control and deals good damage (especially if you hit them multiple times with one projectile). Like Ness, you can become perform a flying electric tackle, dealing heavy damage and great knockback, by aiming the projectile at yourself (it doubles as a recovery move and is better than the same move used by Ness.). Short jump, then press . Freeze with , then jump and use . Lucas has amazing Projectiles. PK Freeze is easier to move than PK Flash, which means greater range to freeze people. PK Thunder causes flinching but can be used to hit more than once. PK Fire doesn't cause continuous damage but can be used to send foes flying. It also can only be shot horizontally, unlike Ness where you can jump and shoot diagonal down. + Smash is one of the best smash attacks in the game. His Wooden Stick can be used to deflect which is nice. Lucas's PSI Magnet only covers half of his body; however, if you get hit with an energy projectile while Lucas has the PSI magnet facing the other direction, he automatically turns around with the magnet and absorbs it. Lucas's throwing ability is good, as his grabbing range is longer than normal and all of his throws except his downward throw cause very good damage and knockback. However, Lucas is one of those characters that if you miss with his throw you leave him open to attack. His Final Smash can be dodged easily but if you get hit by one of them you'll get hit by more. Triple Kick Kicks three times. + + + + Palm Zap Lucas shoots PSI from his palm. + + + + Zap Kick Kicks upwards with PSI shooting from his feet. + + + + Spin Kick Spins around, kicking the opponent. while dashing while dashing while dashing while dashing PSI Strike Lucas shoots three burts of PSI. Smash + + + (Smash + ) or (Smash + ) or PK Love A powerful psychokinetic burst discharged over Lucas's head. Smash + + + (Smash + ) or (Smash + ) or PK Ground Shoots three psychokinetic bursts on the ground. Lucas uses his rope snake to grab. like all other tether grabs, its laggy if missed. after grab after grab after grab after grab Headbutt Lucas headbutts his opponent. after grab after grab after grab after grab PK Throw Psichokinetically throws the opponents forward. after grab after grab after grab after grab PK Toss Psichokinetically throws the opponent backwards. after grab after grab after grab after grab PK Hurl Psychokinetically twirls the opponent and sends them upwards. after grab after grab after grab after grab PK Blast Blasts his opponent with PSI. Strongest down throw in the game. PSI Spin Spins around covered in PSI. + + + + PK Kick Kicks forward with his feet infused with PSI. + + + + PK Twist Turns around blasting PSI. Meteor smashes at the foot. + + + + High Headbutt Headbutts in the air. + + + + PK Stomp Stomps the opponent while blasting PSI. PK Freeze Hold down the input button to increase its range and power. Make note that it travels in an arc. If it hits, it freezes. + + + + PK Thunder You can control which way the lightning ball flies until it disipates. If you hit yourself with it, you'll go flying depending on where you get hit. + + + + PSI Magnet Absorbs energy-based projectiles and turns them into health. He trips and falls down. + ( or )+ or or He pulls out his Rope Snake, which talks to him and he shrugs. + He sparks a little PK flare. PK Starstorm: Lucas unleashes PSI star power, which comes as a starstorm, filling stages, but on big stages they are more spread apart, so it's easier to dodge. This attack unleashes about 14-18 stars, each doing around 17% damage, a little less than Ness's PK Starstorm. An average player will take about 30-50%, and a good player will take 30% damage. Note that Lucas's stars are not as strong as Ness's, but in the end there will usually be a big wave of stars that can be difficult to dodge without good timing. This page was last edited on 25 September 2014, at 21:23. This page has been accessed 45,813 times.